What comes to mind when you think of the brain? You probably imagine a crinkly, walnut-like structure, with a multitude of hills and valleys (gyri and sulci, respectively). But did you know that under this rippled, walnut-shaped outer surface of the cerebrum (referred to as the cortex) lie other structures that are smaller, but equally complex? In fact, there's an entire world of hidden structures with seemingly absurd, tongue twisting names like the basal ganglia (which actually isn't that absurd, since basal means bottom and ganglia refer to a number of nerve cell bodies). You may have heard the basal ganglia being mentioned in mainstream media recently associated with movement disorders like Parkinson's Disease, which burdened the late Muhammed Ali. And rightly so - the role of the basal ganglia is mostly understood as related to the formation, execution, and remembrance of a sequence of movements towards a goal like throwing a punch for Ali or walking for us. For example, the basal ganglia will string together the sequence of movements required to put one foot in front of the other without us having to consciously decide to do so. However, it turns out that in addition to affecting Ali's and your abilities to move, these tiny, but mighty and complex structures also contribute to our motivation and higher-level thinking. The basal ganglia (or BG for short) encompass 5 nuclei. The proper functionality of these nuclei depend on the balance of chemical messengers (referred to as neurotransmitters) that are involved in transmitting neuronal signals in the brain. Imbalances in these neurotransmitters lead to a variety of movement disorders. For example, dopamine is the neurotransmitter that plays a vital role in Parkinson's Disease. Due to the degeneration of the brain cells that produce dopamine, there is a lack of dopamine in the BG, leading to tremors and shaking in patients like Ali. Subcortical nuclei including the basal ganglia. A. Side view of the brain. B. 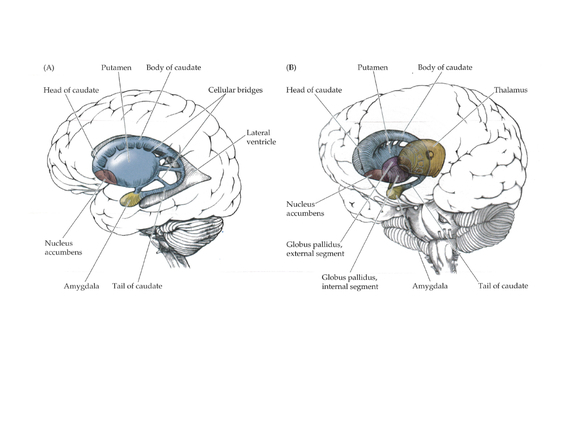 A rotated view to show the structures more towards the front and midline of the brain. Image source: Blumenfeld (2002). But, there's more to the BG than just movement. The 5 nuclei of the BG each have independent functional roles and are also interconnected with different areas of the cortex. For example, recent evidence based on functional connectivity (specifically resting state that we learned about in a previous post) and structural connectivity show that different connections among BG nuclei and cortex align with different motor, cognitive, or affective (a fancy word for emotions) systems. So, together with the cortex, the BG are involved in modifying our movements, planning our actions, switching between tasks, and acting towards a goal - emotional or otherwise. And yet, the many functions of the BG do not stop there! Recent evidence also indicates that the BG have complex roles encompassing learning and motivation, sentence processing and switching between languages in bilingual individuals, as well as processing things that might be rewarding to you or me, such as winning the lottery or getting praise from peers. So how does the BG accomplish so much and have so many seemingly different functional roles? Well, think of the BG as a hub with different parts. Each part is one of the 5 nuclei that has a distinct role differentiating it from the others. Each part also has a set of connections to other cortical systems. So, the BG utilizes its design as a hub, along with connections to other brain regions, to achieve its many functions in a flexible and efficient manner. Ultimately, this general description of the BG stresses the importance of exploring the complex, walnut-like structure that we call the brain as an interconnected network of regions, rather than focusing on individual regions per se. It also emphasizes the inclusion of structures like the BG that are nestled under the cortex within these networks. In future posts, we will learn more about the BG and other hubs in the brain that scientists are beginning to understand in more detail and that we have only begun to explore together. Blumenfeld, H., 2002. Neuroanatomy Through Clinical Cases 2nd ed., Sunderland, MA: Sinauer. Haber and Knutson, 2010. Neuropsychopharmacology, 35(1). Crinion, J. et al., 2006. Science, 312(5779). Draganski, B. et al., 2008. The Journal of neuroscience, 28(28). Di Martino, a et al., 2008. Cerebral cortex, 18(12).